Get this extraordinary diamond tiara for your mother or grandmother, other relative to make her the focus of attention at the party of her 70th birthday! The crystal and beautiful shining rhinestones will add more sparkle and elegance to the whole outfit which makes her more glamorous and look like a real queen. 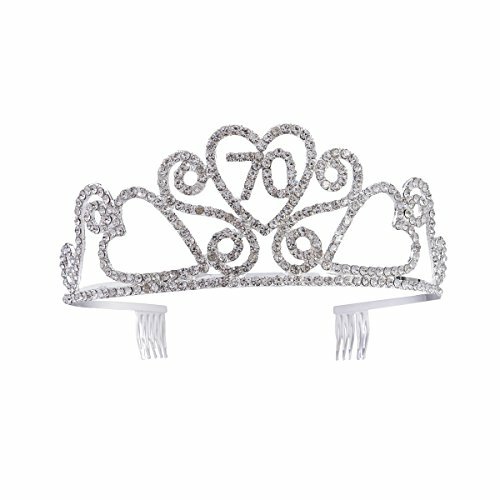 With number 70 design on the tiara, it's a perfect birthday costume decor for 70th birthday party to leave unforgettable happy time for the wearer. - Top-class alloy material with electroplating finishing. Anti- rust, nickel free and anti-allergic for safe wearing. - Perfect accessory for a women's 70 birthday celebration party. A great gift for your mother, grandmother or other relatives. - Creative party accessory with shining and exquisite crystal rhinestones which show royal glory all the time, making the host of the party look like an elegant queen. - With combs design to keep tiara in place all the day for stable wearing, not easy to fall out. - One size fits most. Free size design fits most women. Top-class alloy material with electroplating finishing. Anti- rust, nickel free and anti-allergic for safe wearing. Perfect accessory for a women's 70 birthday celebration party. A great gift for your mother, grandmother or other relatives. Creative party accessory with shining and exquisite crystal rhinestones which show royal glory all the time, making the host of the party look like an elegant queen. With combs design to keep tiara in place all the day for stable wearing, not easy to fall out. One size fits most. Free size design fits most women. If you have any questions about this product by Frcolor, contact us by completing and submitting the form below. If you are looking for a specif part number, please include it with your message.